Midnight Club: Los Angeles is the first installment of the popular Midnight Club racing franchise to release for the PS3 and Xbox 360 game systems. 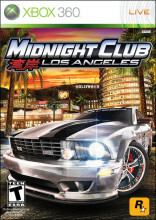 Unlike past installments of the Midnight Club games where there was more than one city to race at, this Midnight Club game (as you can tell from the title) takes place entirely in the city of Los Angeles. And I have to say that Rockstar San Diego did a fantastic job of bringing the city of Los Angeles to life. Cars and people are bustling everywhere, famous landmarks are in place and even stores carry real names such as Best Buy, 7-Eleven and Gamestop. In addition, unlike past Midnight Club games where you raced only at night, this city of LA runs on a day/night cycle so you can race both during the day and night. The story is quite typical of most street racing games, but the story merely plays as the backdrop to what the game is really about and that is street racing. In fact, there is so much racing available that as of this writing, I have still not gotten all the way through the actual story. But as I said, the story is pretty typical, you play as the new guy to LA who has only enough money to buy an old car, but through street racing you will start to earn more money and rep to buy better cars and to become a high-end sought after street racer. There is some mild violence in the game in that cars can crash. If you are riding a motorcycle and you crash your body will be thrown from the bike, but there is no blood, gore or death. The streets are also alive with people, but everyone in this LA has lightning quick reflexes as everyone will jump out of the way before you have a chance to run them over. The ESRB also notes on the game case that Midnight Club LA is rated T for “Strong Lyrics”. This would be pertaining to the music in the game. I checked out some of the song lyrics from the game on the internet and although I believe that the songs have been edited for the game, it is not too hard to fill in the blanks. There is an option, however, to create your own playlist so if there is a song where you find the lyrics to be offensive or too inappropriate for your family you can keep that song from your playlist. So far in the story mode, I have come across one woman who was sporting some cleavage. There is no spiritual content in Midnight Club LA. Street racing is illegal and there will be times when you will be chased by the cops and have to lose them. Midnight Club: LA is a lot of fun and the way that the game developers made the city of Los Angeles come alive is top notch, but this game is also very challenging in that there is very little room for error in these races. Also, as a parent I am concerned about some of the lyrical content from the game’s soundtrack as well as from some of the trash talk that takes place. With that in mind, I would not recommend Midnight Club LA for young kids. this game is fun right?